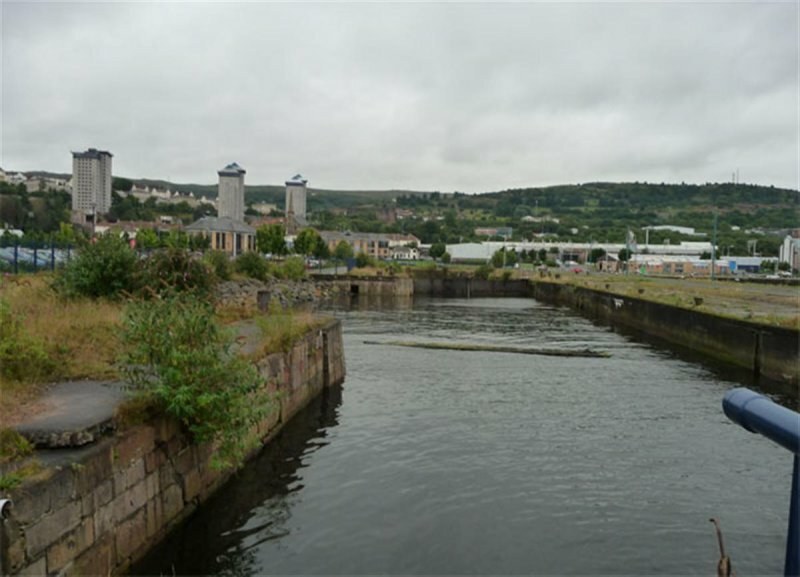 Oblong dry dock roughly 110m long and 20m wide, with semi-octagonal S end, stepped sides, later steel gates, and outer basin to N. Sandstone ashlar. 2 steeply sloped ramps on each side. Iron rings at regular intervals along cobbled quayside. Remains of cast-iron operating machinery including capstan with Stothert & Pitt of Bath maker's plate. 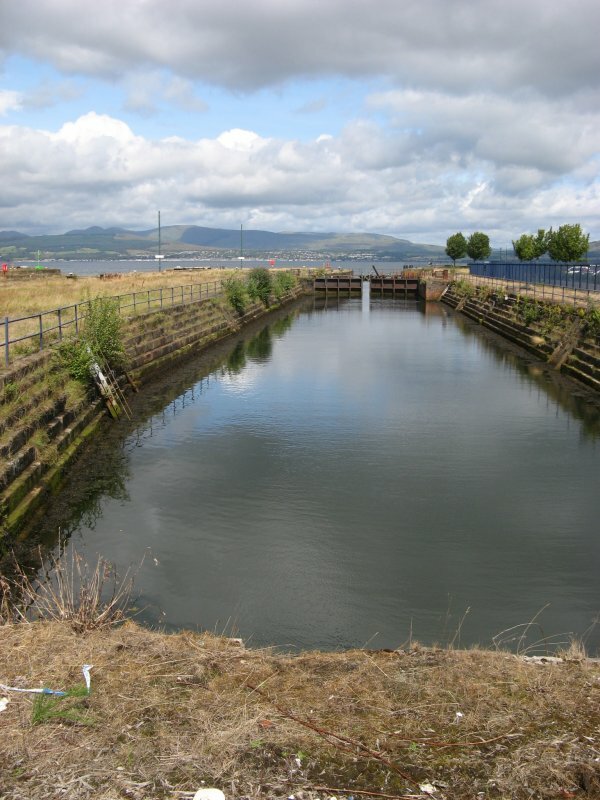 Rectangular outer basin (partly filled in to E side) with roughly 20m entrance to Clyde. Also known as the Submarine Dock. Situated in Cartsdyke, off Rue End Street, between Victorian Harbour and the T-Mobile office. 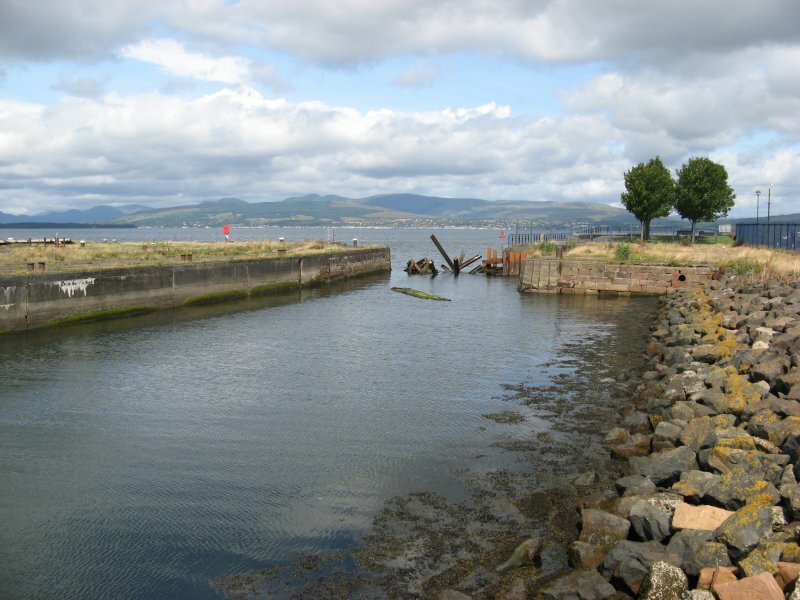 It is believed to be the oldest surviving dry (or graving) dock in Scotland. 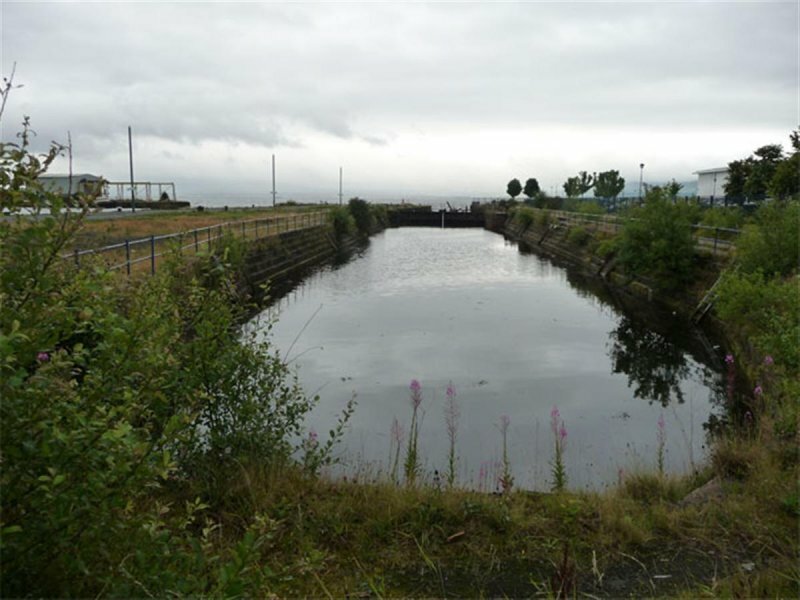 There are 8 dry docks currently (2005) listed in Scotland, the oldest of which is the one in Troon, which was built in 1840s; all the others were built in the 2nd half of the 19th century. Built for Steele's shipyard, which occupied this site until it closed in 1883, at which point it was taken over by Scott's. James Steele was born in Ayr, and started his career building fishing vessels and coasters in Saltcoats. He later joined partnership with John Carswell, and the firm Steele and Carswell moved to Greenock in 1796. It is therefore possible (although unlikely) that the dry dock dates from this time. In 1816 the Steele and Carswell partnership was dissolved and Steele joined partnership with his sons, Robert and James. 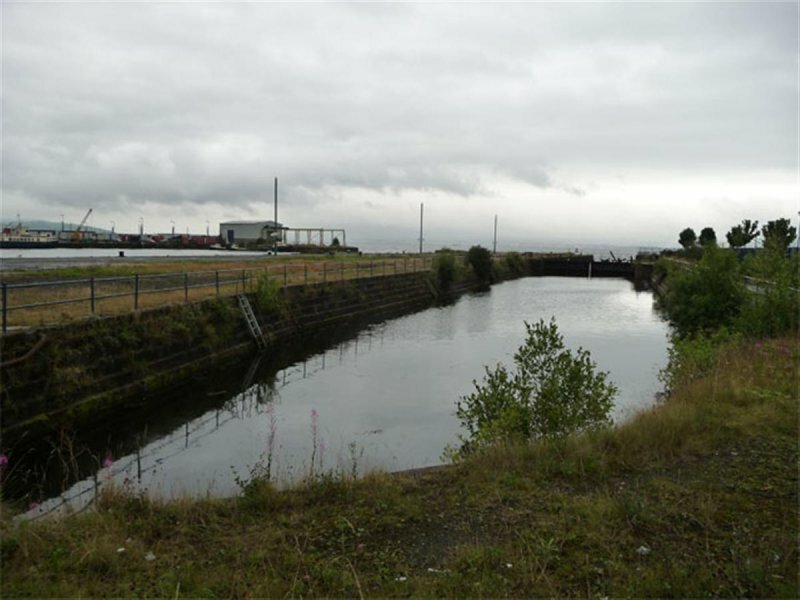 In the 1820s the firm began building steam ships, and it is likely that dry dock was built at about this time. The dry dock and outer basin are shown on John Wood's Town Plan of 1825; the 1838 town plan is more specific, marking the graving dock in 'Mr Steele's Ship Building Yard'. It is interesting to note that the Dry Dock in East India Harbour, which was completed in 1823, is marked as 'New Graving Dock' on the 1838 map, which perhaps suggests that Steele's dock was older. 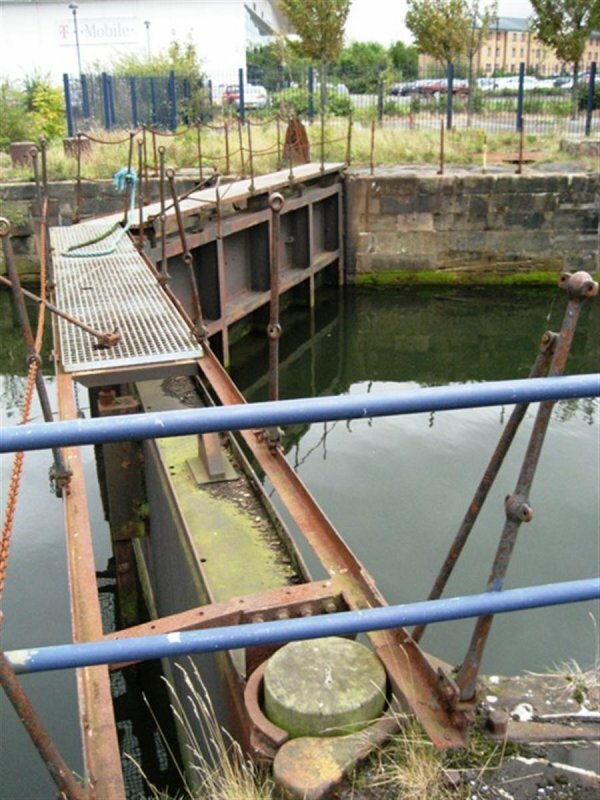 August 2008: External inspection reveals that the dock is flooded with water. 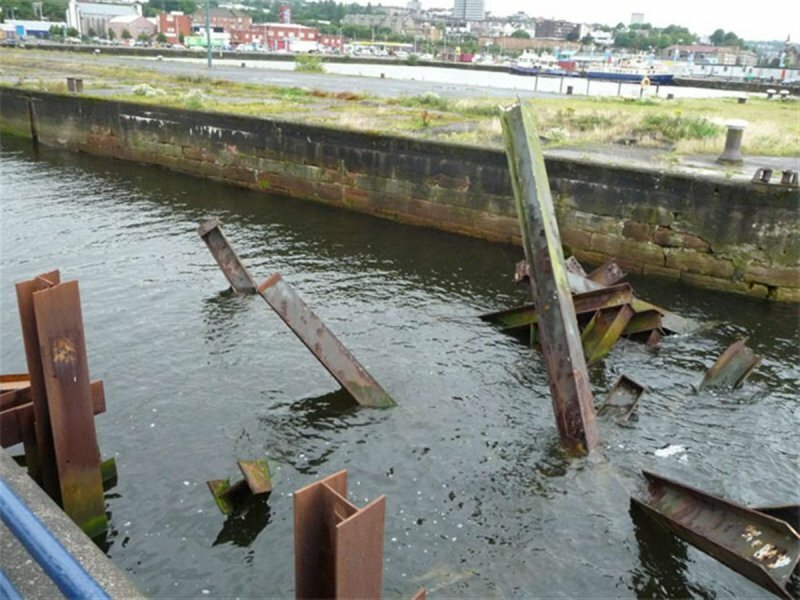 Fencing surrounds the structure with signs which state that the quayside is dangerous. Metal beams block the entrance into the outer basin and the steel gates and other metal fixtures appear corroded. 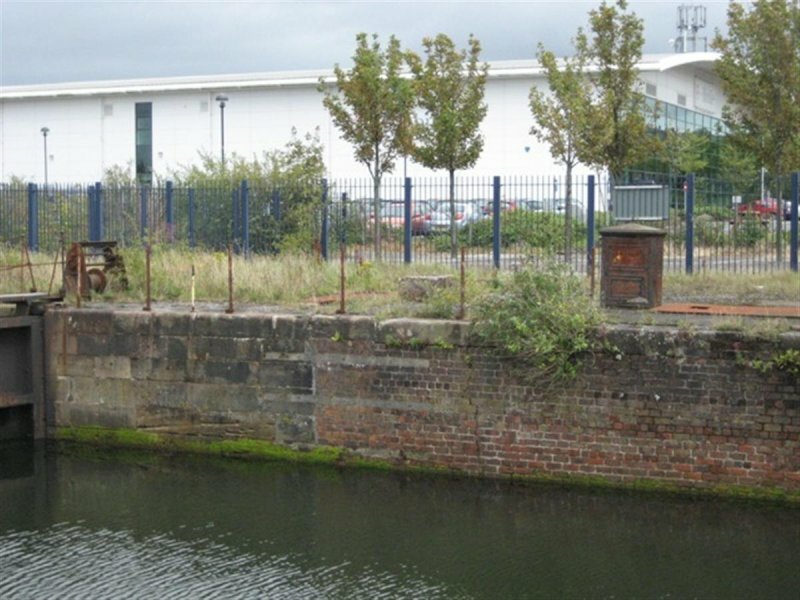 The stepped masonry sides of the dock are overgrown with vegetation and some of the masonry appears to be loose. 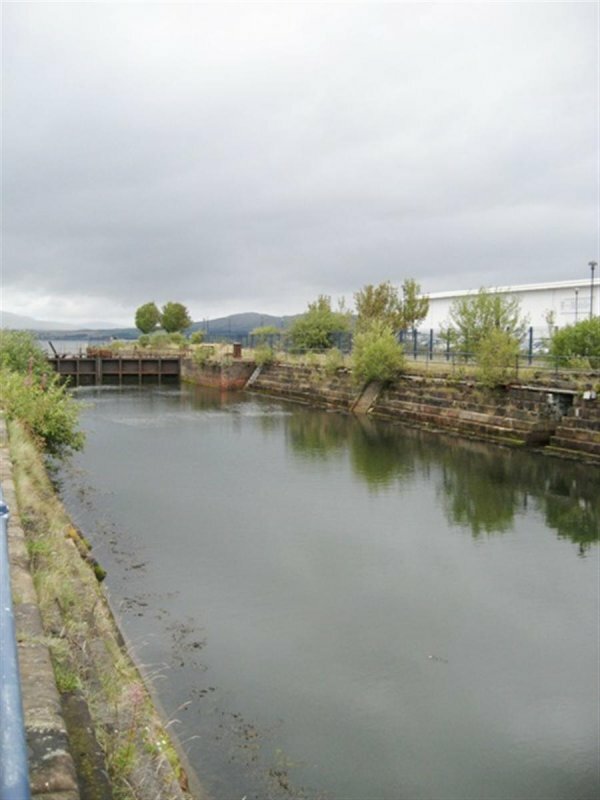 December 2008: Local planners report that the dry dock is now owned by Riverside Inverclyde regeneration company. 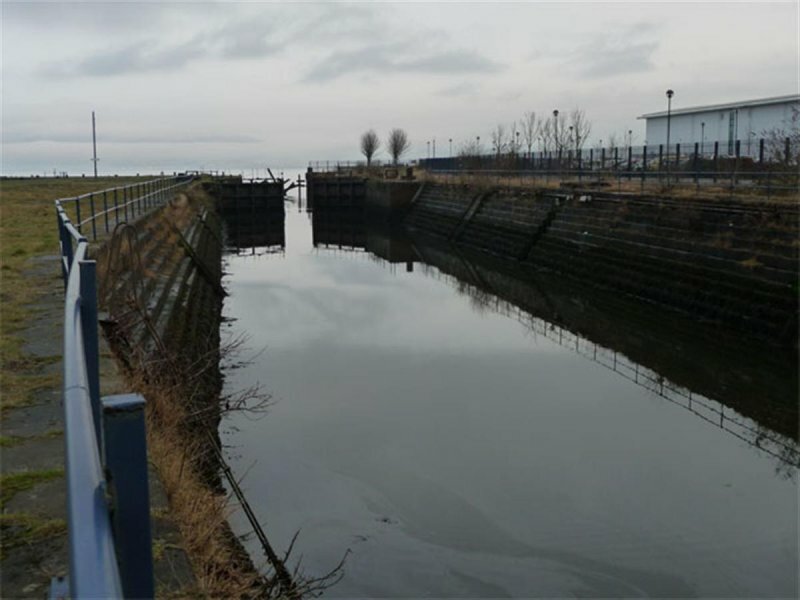 January 2010: External inspection finds no change to the condition of the dry dock from previous visit. 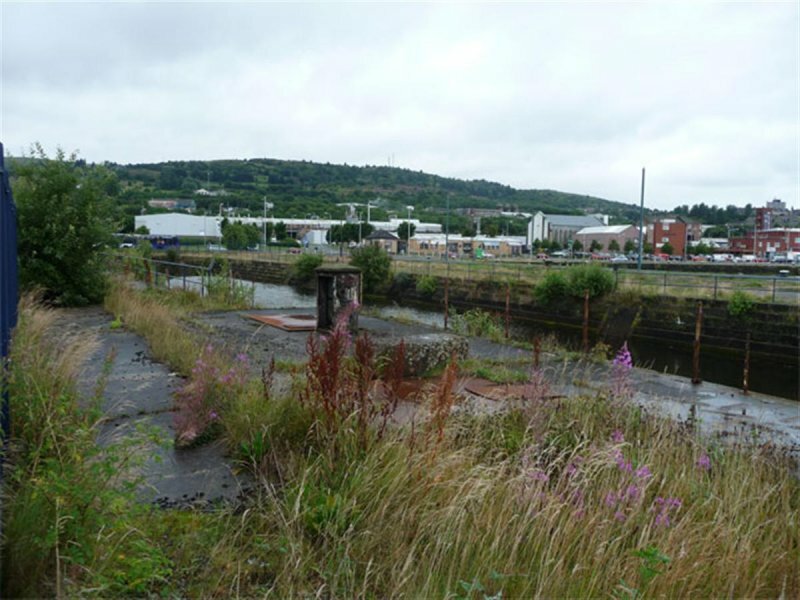 August 2011: External inspection finds no significant change since the previous site visit. 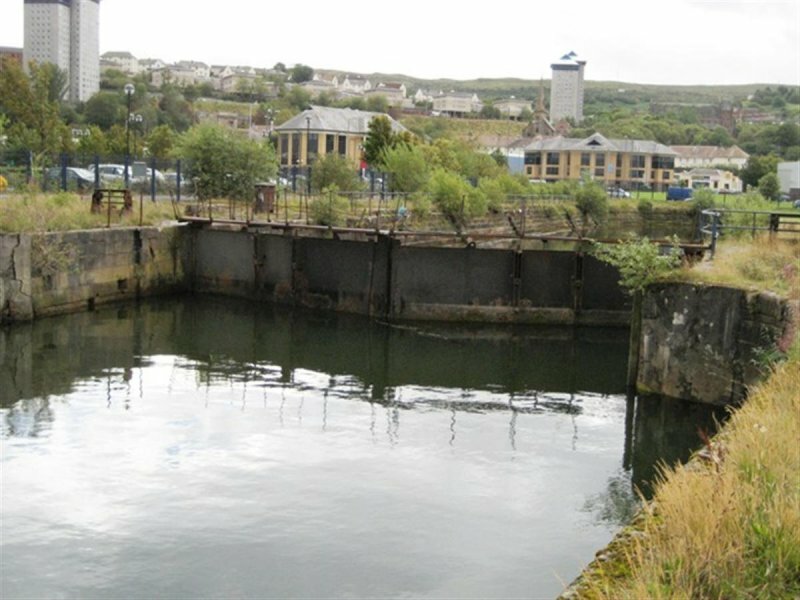 13 August 2014: Inspection finds the former dock remains in poor condition. 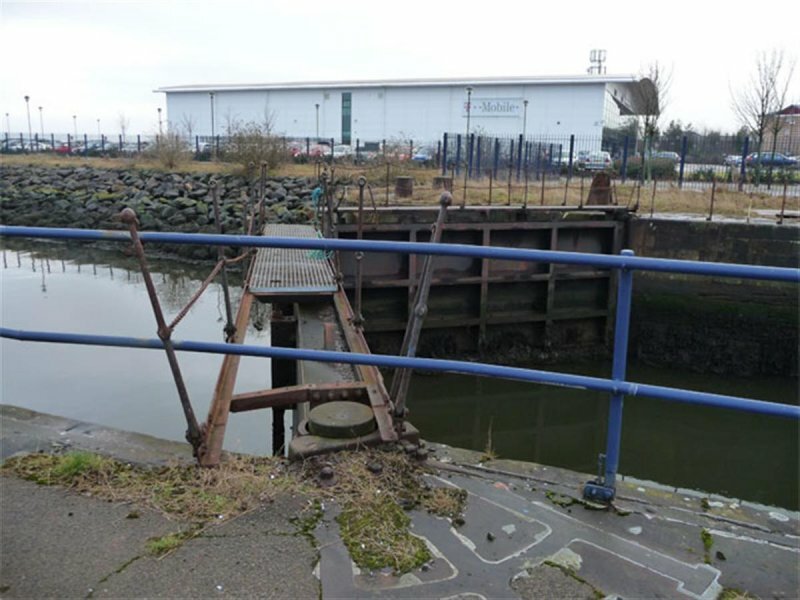 30 March 2017: The McLean Museum advise the dock probably dates from 1818 and built at the same time as the Lamonts Dry Dock. Shown on John Wood, `Plan of the Town of Greenock from Actual Survey', 1825 and `Plan of the town of Greenock and its environs' by Andrew MacFarlane 1838-1842 (courtesy of Watt Museum, Greenock). Shown on 1st edition OS map circa 1857). Extension to S shown on 2nd edition OS map (circa 1898). SHIPPING AND SHIPBUILDING RECORD (1948, Volume 71 No 4, Jan 22nd p109-112 (article on Steele's Shipyard with undated old photograph of dry dock). George Woods, ROBERT STEELE II, (2004) article on Inverclyde Council, Museum & Art Gallery website.